The best hostel I have ever been. The host makes it an amazing experience. The hostel mates were also so cool. The bed and screen around it makes it an extremely comfortable. The kitchen is well equipped. All the places are so clean. The decor is amazing. The location is perfect. I arrived for christmas We had Christmas dinner with Evan and the hostel mate. I felt at home and I was really impresses. They help you in every way to make you feel comfortable and happy. Best best. Brilliant hostel right beside the beach.its very social or not depends what you want.Alejandro is such a great host and goes way beyond for every guest. The hostel is really nice lots of amenities and very clean and comfortable.highly highly recommend this hostel. Alejandro built up this hostel with great sense to details and care. Facilities are all new, matraces and linens super comfy. Go and try it yourself! Nice hostel with a quite friendly and warm owner. I felt really comfortable! 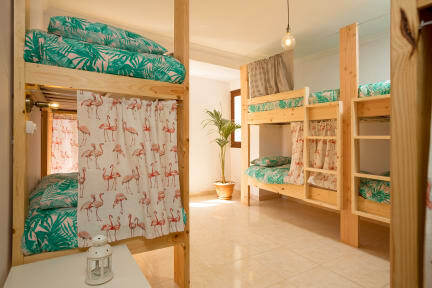 This is a fabulous young hostel! Alejandro has put the place together with love, with attention to detail, with 100% understanding and care for the needs and desires of his guests. I hope to have the opportunity to return some day. AND IT’S A FEW STEPS FROM THE BEACH!!! One of the best hostels I have been to so far. Alejandro, the owner, was really nice and helpful in explaining everything I needed to know about the island, from directions to local food, sports, and culture. I felt very safe, welcome, and most importantly I felt like at home. I would definitely stay again. Good luck, Alejandro! An amazingly inclusive hostel with staff who made fresh coffee in the morning, offered help, and were brilliant cleaners. 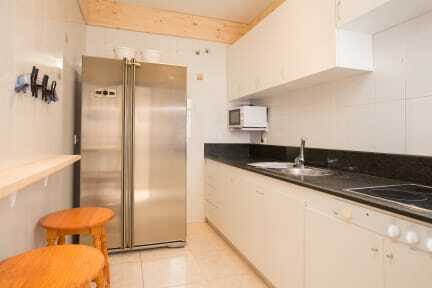 The location was right by the surfing beach, near the huge shopping mall, with buses to Aguete nearby. This place is really cool! I wish I’d stayed two nights instead of one. It’s a nice chilled out hostel, right next to the surf beach if you plan on going. The beds are comfy and spacious. Nice staff and cool roof terrace.